We get two NFC North vs NFC West Matchups as the leaders face off against each other on Sunday night, while the 2nd place teams fight to stay in playoff contention on Monday night. Neither game looks like there will be a ton of offense, but we'll find options for both. Seattle ranks 15th DVOA against the Rush and 16th against the pass. Against individual positions, Seattle is 26th against WR1, 18th against WR2, 14th against TE, and 13th against pass-catching RBs. Four of the five highest priced players in this showdown slates are from Minnesota. Kirk Cousins (10,200) has only thrown for 3+ touchdowns three times all year, and two of those games were against Green Bay. His recent road numbers have not been great (10.04, 18.98, and 17.54 fantasy points in his last three road games). We did see Nick Mullens throw for over 400 yards against Seattle last week, so I don't mind taking the chance on him; I just don't think he's a must-play. Dalvin Cook (8,800) hasn't seen more than 10 carries since week one. He was bailed out by 10 targets and 8 receptions last week. I think he's an OK play, but the price seems a little high on him. My main interest is going to be with the receivers: Adam Thielen (11,800) and Stefon Diggs (10,800). I will probably do what I can to get both into my lineups. Thielen disappointed in New England last week, but I don't think Seattle will be able to scheme him out like the Patriots did. Seattle's low ranking against #1 WRs also has me thinking Thielen will be just fine here. Diggs had seen double-digit targets in his last four games before being taken away last week. He's more of the TD threat, with Thielen more likely to get to the 100-yard bonus. Aldrick Robinson (2,200) saw 9 targets a week ago, but have a hard time imagining him seeing anything more than his usual 2-3 targets. He does have a nose for the end zone so punting with him isn't the worst play. The Minnesota Defense (3,600) could be in a decent spot, as they have the 8th most sacks on the year, and Seattle allows the 8th most sacks. 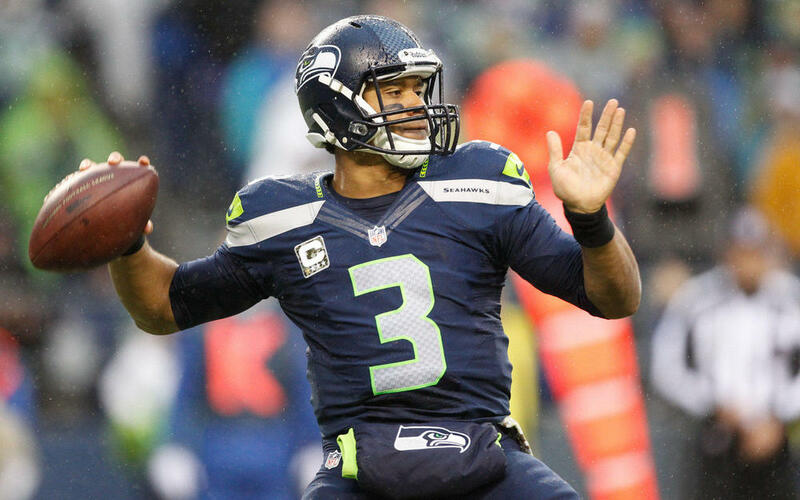 They have 11 interceptions on the year, but Russell Wilson has only thrown five picks. I think Minnesota is probably safe for 4-6 points, with some upside to get to 8-10 without a random Pick Six. Minnesota ranks 9th DVOA against the Rush and 11th against the Pass. Against individual positions, Minnesota ranks 3rd against WR1, 15th against WR2, 26th against TE, and 31st against pass-catching RBs. Russell Wilson (11,200) has only one game where he hasn't thrown 2 touchdowns, and that includes a couple of games where he threw less than 20 times. He threw for 4 touchdowns on just 17 passes last week. He will add about 15-20 yards rushing, helping his floor slightly. I think I like him better than Cousins just due to floor and consistency. But, I don't think he's a must play. Chris Carson (7,600) has consistently been seeing over 50% of the running back snaps. This could increase if Rashaad Penny (4,400) misses, as he was a late addition to the injury report with an ankle injury. While Minnesota is tough against the run, we know Seattle likes to run the ball. I think this is a fair price on Carson and if he can catch 2-3 passes like the past couple of weeks, he should get to 12-15 points, making him a good floor play. Mike Davis (2,600) could be in line for additional production if Penny misses. He's more of the pass catching running back, and as we saw in the DVOA numbers, Minnesota is second-worst against pass-catching backs. He's been seeing around 25% of the snaps recently, but I could see this go towards 40% if Penny misses. And if so, I'll probably play him and Carson to get all the RB production. If Penny does play, I will probably avoid, as a late addition to the injury report with an ankle injury doesn't seem ideal. The big news to keep an eye on leading up to game time is the status of Doug Baldwin (7,000), who is questionable with a groin injury. Baldwin has been dealing with nagging injuries all year and hasn't put up more than 18 fantasy points in a game. At this price, I will pass if he is active. Tyler Lockett (8,200) will be good for about 4-5 receptions, and one rush. His nine touchdowns on the yeare gives him upside, and maybe he gets a couple of more catches if Baldwin misses. He may also see Xavier Rhodes, and if, I don't like him at this price. If not, he's a fine floor play. David Moore (5,200) is your boom/bust option. In his last seven games, he has three games above 10 points, and four below, including a zero last week. Nick Vannett (1,800) or Ed Dickson (400) are viable punt plays, as the Vikings do struggle against tight ends. Dickson has been seeing more snaps as of late, but last week was nearly an even split. I'm fine punting with either one. Seattle Defense (3,800) has been about league average in sacks and Minnesota is league average in allowing sacks. Cousins does have 9 picks on the year, but I think I prefer the Vikings defense here. Finally, Sebastian Janikowski (3,400) has been around 7-10 points a game this year. He still has a strong leg, so his 50 yard potential puts him in play here. Possible Captains: Tyler Lockett, Chris Carson, Mike Davis (if Penny is out), David Moore if playing multiple lineups. Chicago ranks #1 DVOA vs the Rush and vs the Pass. Against positions, the Bears are 2nd against WR1, 14th against WR2, 5th against TE, and 9th against pass catching running backs. This is a tough spot for the Rams, going into a cold environment on Sunday Night. Jared Goff (10,000) has only one game on the road where he's gone above 20 fantasy points this season (33.34 at New Orleans in Week 9). This doesn't seem like the spot for him to get his second, especially coming off a 10 point game in Detroit last week. Though if you do want to play Goff, the Bears only have four games this season where they allowed less than two touchdown passes, with Rodgers and Osweiler being the only ones to go over 300 yards. Todd Gurley (11,400) has a tough challenge, as the Bears have only allowed two 100-yard rushers all year (Frank Gore and Saquon Barkley in Overtime), and only 2 rushing touchdowns. Gurley is talented enough to succeed on the ground and through the passing game; however, I think you have to lower expectations. He will be fine from a floor perspective, and while you can always play Gurley at captain, I don't think this is the best spot. I will probably be playing him in the flex as I think 20 points is going to be in play this week in this game. However, I don't hate a fade of him either. I don't mind the Rams WRs in this spot if you want to take a chance on the Rams passing game. Brandin Cooks (9,400) is the WR1, and while the Bears are good against them, they have given up production to speed guys (Albert Wilson and Randall Cobb) and true WR1s (Odell Beckham and Stefon Diggs). Robert Woods (9,600) has seen 19 targets the past two weeks in the slot. He provides a nice floor, and that 15 points may be in play this week. Josh Reynolds (6,400) didn't do much on five targets last week. He is a GPP upside play, though I think this price is too high. You can take a chance on either tight end, but I prefer Tyler Higbee (1,400) of the two, as he's seeing more targets as of late. I would only be interested in the Rams Defense (3,600) if Chase Daniel starts. I do have interest in Greg Zuerlein (3,400), who has double-digit points in all but one game. L.A. is 8th in DVOA against the pass and 25th against the rush. Against positions, the Rams are 21st against WR1, 13th against WR2, 27th vs other WR, 8th against TE, and 5th against pass-catching RBs. I do like the Bears offense better in this game, but I also think the Rams defense is better than the numbers show (remember, they played the Saints and Chiefs this year). It looks like Mitchell Trubisky (9,800) will return, and he has been great at home, averaging 29.5 fantasy points a game. His rushing upside helps to give him a higher floor, and the ceiling is enormous if he finds the end zone and throws for a couple. He's my preferred quarterback of the two in this game. I have a little interest in Jordan Howard (4,600) in a good matchup and he should see 10-15 carries. He's an ownership pivot off of Tarik Cohen (8,600), who will continues seeing a lot of targets. I think he has a floor of around 10-12 points, with a 30 point ceiling. I don't think he hurts your lineups, but isn't one you have to force in. I prefer Cohen, but don't hate Howard here. Another reason I think the Rams defensive numbers are a bit inflated is that they were with out Aqib Talib until last week. That's bad news for Allen Robinson (7,800) who will probably see Talib this week. Robinson has the most upside of any Bears receiver, but this may not be the spot. I don't mind the combination of Anthony Miller (6,200) and Taylor Gabriel (5,600). Gabriel has seen 27 targets the past three games, but Miller is more of the TD threat. I think I like Gabriel more, but could see myself rostering both. I have minimal interest in the tight ends, as they aren't being used much right now. The Bears Defense (2,600) seems a bit cheap, and don't mind them due to their ability to get to the QB and force turnovers. Ever since he hit the goalpost four times against Detroit, Cody Parkey (3,000) hasn't missed a kick. He's fine if rounding out a roster, but prefer Zuerlein for 600 more.